Golden-Eyed Primrose is a beautiful primrose with flowers which range from yellow to lavender to blue. The yellow-flowered species is supposedly Primula strumosa, but it hybridizes freely with Primula calderiana resulting in colonies where flowers of every color imaginable exist! Although flower color varies, but the golden eye is common to all. 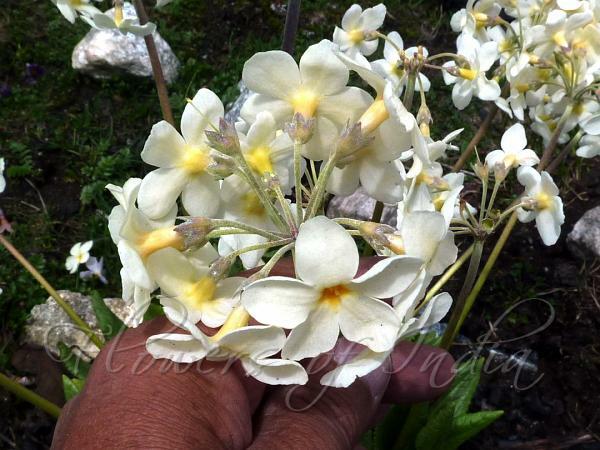 Flower-stalks are 1-2 cm long, powdery. Each flower is wide open, with a small ring of orange near the centre. Flower tube is 1.1-1.3 cm, limb 1.5-2.5 cm wide. Petals are round, not notched. Sepal cup is bell-shaped, 5-7.5 mm, densely yellow powdery, parted to middle; sepals ovate to ovate-oblong, margins overlapping, tip blunt. Leaf-stalks are broadly winged, concealed by basal bud scales at anthesis, becoming diffuse, about as long as leaf blade. Leaf blade is oblanceolate to obovate or oblong, 5-20 x 1-2.5 cm at anthesis. Flowering stems are 7-19 cm, yellow powdery towards the top, elongating to 35 cm in fruit, with umbels of 4- to many flowers. Sepal cup is bell-shaped, 5-7.5 mm, densely yellow powdery, with ovate to ovate-oblong sepals with blunt tips. 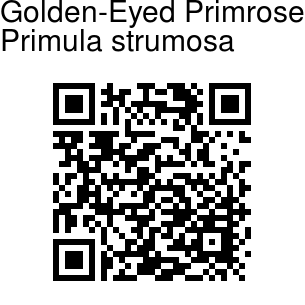 Golden-Eyed Primrose is found in Eastern Himalayas, in Bhutan and Arunachal Pradesh, and China, at altitudes of 3500-4300 m. Flowering: May-June.